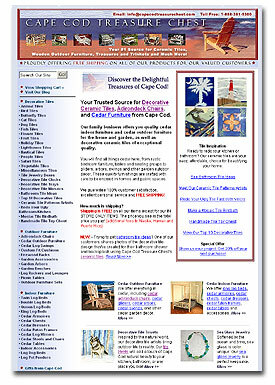 Shop with us online at our website, Cape Cod Treasure Chest. We carry beautifully-made cedar outdoor and indoor furniture. You won't want to miss our collection of adirondack furniture, too. Our ever-expanding line of decorative tiles are bringing charm to homes across America, and we also have a selection of gifts which are sure to bring Cape Cod home to you!